Edwyn sits, originally uploaded by Edwyn UK. I have realised this blog’s namesake has yet to have a proper look in on the photographic side. I don’t really want to inundate the blog with dog photo’s (we have flickr for that) but I think I must share this sitting photo. I just love the way these terriers sit with their legs sticking out. 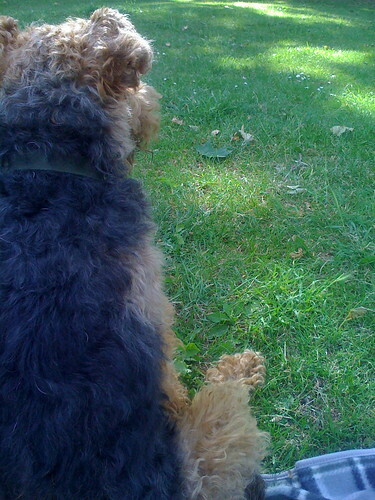 And here Edwyn is, sat nicely watching football on a picnic rug in Battersea Park. Ahhhhh. It’s a tough life.